Home | Serigraphs and Giclee Fine Art | Liudmila Kondakova Parisian Art | Liudmila Kondakova Signed And Numbered Limited Edition Serigraph:"Eiffel Tower At Dawn "
Liudmila Kondakova Signed And Numbered Limited Edition Serigraph:"Eiffel Tower At Dawn "
Image size:27 " x 36 "
About the Print:When I paint the streets of Paris, I usually do not put a lot of people there. I would prefer to establish intimate contact between the viewer and the place I am painting." - Liudmila Kondakova In the early morning quiet of Paris, Liudmila Kondakova shows us the beauty to be found in stillness, and how something as immobile as a building can come to life with color and light. 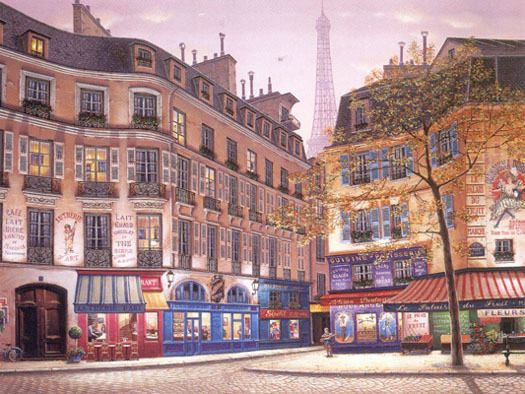 Eiffel Tower at Dawn, alive with her signature imagery, invites us to witness the daily renaissance of Kondakova's beloved Paris. In anticipation of the busy day ahead, the streets of Paris take on a life and beauty of their own. With the only movement being a few people inside the shops and one girl bringing home baguettes for breakfast, the multitude of colors, intricacies of architecture, and burnished patina of the buildings themselves provide the drama of the foreground. In the distance, however, muted and veiled by the early-morning mist, La Tour Eiffel still dominates the scene. It draws your gaze with its towering presence, dramatic history, and instant familiarity. Designed by Gustave Eiffel, an engineer who also designed the Statue of Liberty, it was built for the 1889 International Exhibition, the centenary celebration of the French Revolution. It was a colossal fairground attraction, which later became a symbol of modernity and the avant-garde, inspiring poets, film-makers, photographers, and painters alike. Liudmila Kondakova and her fans are likewise inspired by the power of its presence, especially in the dawn's early light. Home | Fine Art Prints & Limited Editions | Gallery Direct Art is your Authorized Chalk & Vermilion Dealer | Liudmila Kondakova Parisian Art | Liudmila Kondakova Signed And Numbered Limited Edition Serigraph:"Eiffel Tower At Dawn "